Some of the UK’s largest businesses are currently seeking PropTech innovations to improve their building performance. Do you have the next big breakthrough? 5. Water and waste management. The Partners of the Innovation Gateway, including Tesco, Heathrow Airport, Royal Bank of Scotland, Nottingham City Council, Unite Students, Places for People, and more, have identified these five areas as some of the most pressing issues that they are currently facing, and are therefore seeking PropTech solutions to address them. The Innovation Gateway is an alliance of organisations working together to reduce the costs and environmental impacts of their buildings. Partners have identified savings of millions of pounds per year, and substantial reductions in CO2 and water from innovations sourced and piloted through the programme. Kingfisher plc is specifically seeking sustainable goods to resell in their stores, as well as sustainable materials for some of the products they make and sell themselves. It is hard to break into the supply chains of big business without credible references and real-world performance data for your solution. 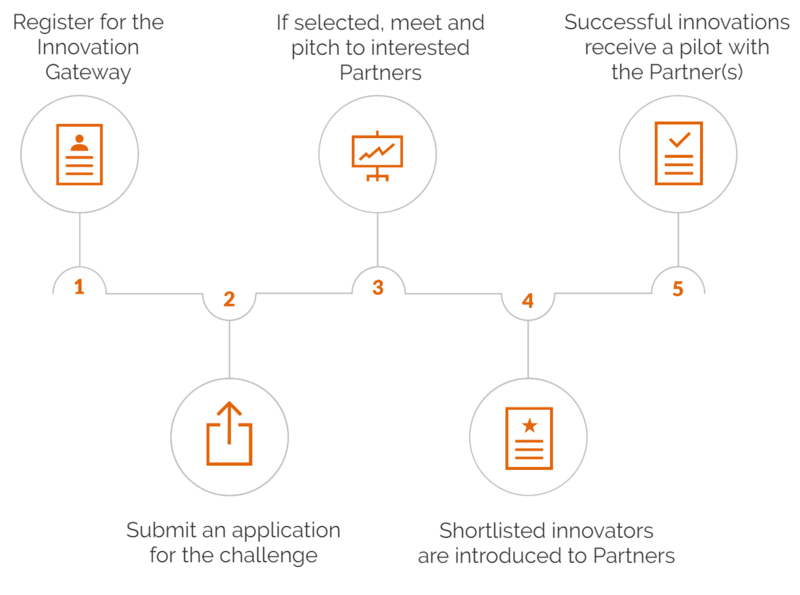 The Innovation Gateway is designed to support SMEs, whether you are an early stage innovator, or a mature business, based in the UK or overseas. If your innovation has the potential to tackle the above building challenges, the Partners want to hear about it. The Partners are looking to identify solutions that address the issues they are facing through a fully funded pilot. This gives you the opportunity to collect real-world data and gain validation through some of the most well-known businesses in the UK. It is also a great way to gain access to the UK markets for any innovators based abroad. To date, the platform has sourced over 600 targeted innovations globally for the Partners, through an award-winning innovation sourcing approach. One of the most exciting things about the Innovation Gateway is that it enables and encourages collaboration between the Partners. Therefore, if you run a successful pilot with a Partner, not only is it likely that they will scale this up across their own extensive property portfolio, but they may well recommend it to the other Partners, thus greatly increasing the size of the opportunity. Go to Innovation Gateway website to find further details on the five PropTech challenges that the Partners are seeking solutions to. Measure My Energy is just one example of an innovator that benefited from this alliance of organisations. Following the completion of a successful pilot and positive feedback from Royal Bank of Scotland, Nottingham City Council decided to pilot them. Measure my Energy will be hoping to roll the innovation out more widely in the near future once they have proven their solution through the trial. Don’t miss the Innovation Gateway panel Open Collaboration Case Study: Transforming the performance of buildings through innovation at FUTURE : PropTech on May 14th, 2019 at 14:50 pm. The Partners from Tesco, RBS and Nottingham City Council will share their experience of collaborating in Innovation Gateway, and can give innovators an idea of how they can get in front of and work with large businesses like them in the UK.